Report recommends ESA changes in B.C. 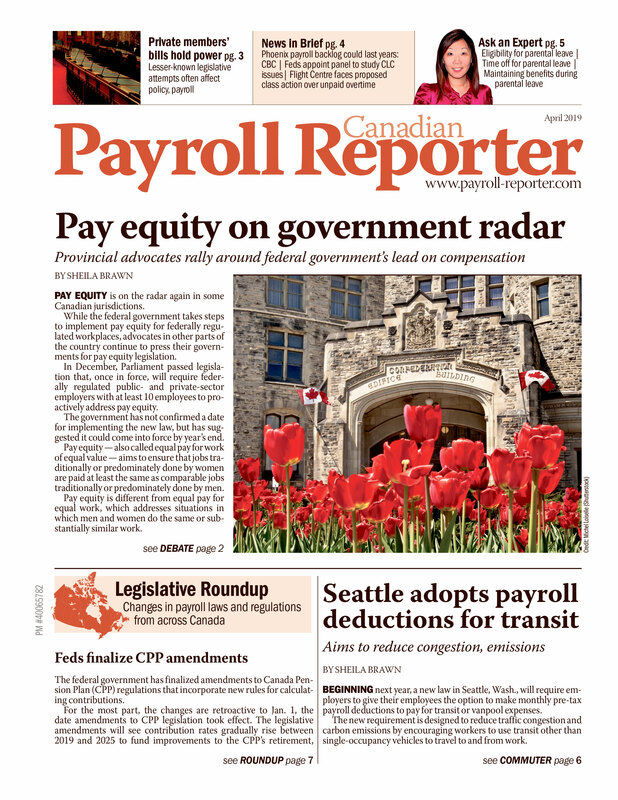 Changes to the rules for paying employees could be on the way in British Columbia if the province’s government adopts recommendations in a new report, stemming from a four-year review of the province’s Employment Standards Act (ESA) by the British Columbia Law Institute (BCLI). It makes 71 recommendations affecting direct deposit rules, wage assignments, vacation pay, statutory holiday eligibility, leaves of absence, and termination rules, among other topics. The report comes at a time when the government is considering modernizing the ESA. “Updating B.C.’s employment standards is one of my main priorities — making sure our standards are applied evenly, enforced and reflect the changing needs of today’s workplaces,” said Labour Minister Harry Bains. Direct deposit: The report recommended eliminating a requirement for employees to consent to direct deposit. Despite the widespread use of direct deposit, the report said employers cannot implement it as the standard payment practice in the workplace without first obtaining individual employee consent or authorization under a collective agreement. “It is onerous and impractical to compel an employer to maintain a separate manual payment system for an isolated objector when all other employees are paid by direct deposit,” it said. To ensure that employers do not violate privacy or protection of information laws if employee consent is removed from the act, the report recommended that the ESA specifically authorize employers to collect, use, and disclose employees’ personal information on banking arrangements without needing their consent for direct deposit of pay. The authorization would override restrictions in the Personal Information Protection Act and the Freedom of Information and Protection of Privacy Act. To address employee concerns about employers having their banking information, the report suggested that employees could open a separate account for their employer to deposit their pay and then they could transfer the money to their regular bank account. Wage assignments: The report recommended that the ESA allow employees to make an “irrevocable written assignment of wages” authorizing their employer to deduct amounts from their pay to repay advances their employer paid for salary, vacation pay, and the like. It also recommended eliminating a provision that allows employers, if they so choose, to honour an employee’s written wage assignment to meet a credit obligation. Statutory holidays: The report recommended new eligibility requirements for paid statutory holidays. Currently, employees must work for their employer for at least 30 calendar days before the holiday and have worked or earned wages on 15 of the 30 days. Exceptions apply for employees working under averaging agreements. The report proposed that employees be eligible for statutory holiday pay if they work or earn wages on 16 of the 60 days before the holiday and they work on their last scheduled day before the holiday and first scheduled day after it, unless they are sick or have permission to be absent. “The first branch of the proposed eligibility rule would give part-time employees a longer qualifying period within which to accumulate working time equivalent to about two days per week,” the report said. Vacation pay: The report recommended changing the requirements for vacation pay. Currently, employers must pay it in a lump sum at least seven days before an employee’s vacation begins, or, with the employee’s written consent or union agreement, they may pay it on scheduled paydays. In reality, most employers continue paying salaried workers their regular pay during their vacation, according to the report. The report also noted that the reference to “scheduled paydays” is ambiguous, possibly referring to each payday or only to those that occur during an employee’s vacation. It recommended that the act give employers three options for paying vacation pay: paying the employee’s salary during the vacation, adding vacation pay to each pay (with later adjustments if needed to ensure the correct amount is paid), and paying it in a lump sum one week before the vacation begins. On the issue of vacation entitlement, the committee was divided. While the majority recommended no changes (for example, keeping entitlement at two weeks’ vacation after one year and three weeks after five years), a minority suggested four weeks’ vacation after 10 years. Leaves: The report did not recommend widespread changes to the leaves of absence allowed under the act. A majority of committee members did recommend replacing the ESA’s five-day family responsibility leave with a seven-day leave for personal illness or family responsibilities. The report did not recommend adding other leaves that are becoming more common in other jurisdictions, such as those for critical illnesses, domestic violence, organ donation, and citizenship ceremony. It said that while these leaves relate to important life events, they likely would not be applicable to most employees. “The project committee is disinclined to recommend adding new leave entitlements to the ESA that will increase the complexity of the act and potentially impose significant burdens on small businesses, without being of benefit to the greater part of the workforce,” said the report. Termination: The report recommended that the ESA include provisions to address situations where an employee who gives notice to quit is then terminated by the employer before the end of the employee’s notice period. It suggested that in this situation, employers pay employees the lesser of the amount of wages they would have earned during the remainder of their notice period and the amount that would be owing for length of service if the employer had terminated them without notice. The report also recommended changes to the group termination provisions to allow employers to meet the notice requirements by providing employees with a combination of notice and termination pay. The report provides government with a range of perspectives on what is needed to ensure our labour legislation supports a growing economy, said Bains.